Aldi Weekly Ad September 19 - September 25, 2018. Kid's Activities on Sale! 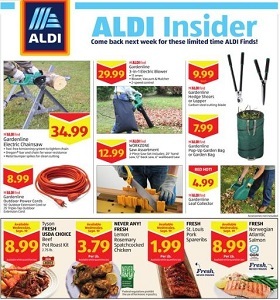 Aldi Weekly Ad September 19 – September 25, 2018. Kid’s Activities on Sale! -$18.99 Adventuridge Men’s or Ladies’ Hikers; $24.99 SOHL Furniture Faux Fur, Quilted or Mongolian Saucer Chair.